Chemical treatment of elliptical cavities (h ≤ 150 cm). Station under ventilated fume hood. Chemical treatment cycles are automated. Currently, the acids are not filtered, but it is possible to install a filter in the circuitry. Additional facilities: ultrasonic degreasing station (10 l and 350 l), adjoining storage room (acids, solvents), effluent treatment plant (water, acids, vapors). This station was mainly used in the framework of the ESS project. 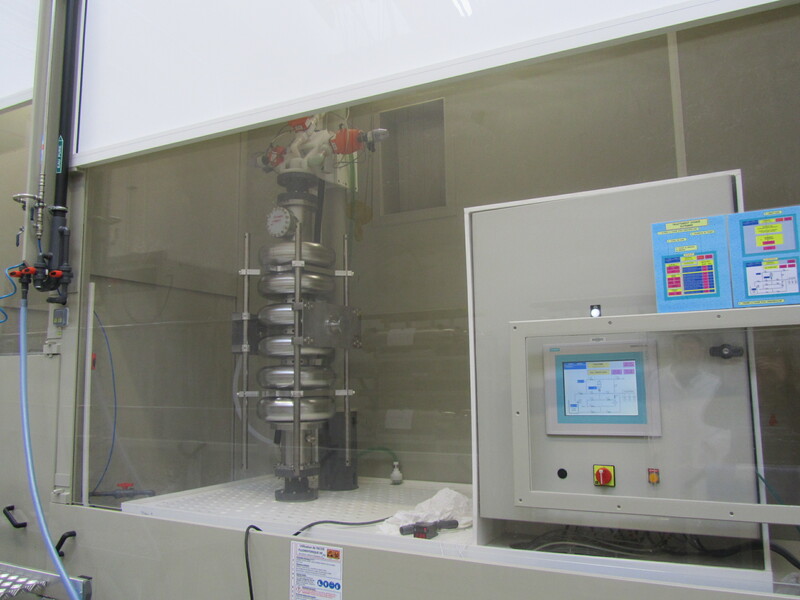 After ultrasonic degreasing in an alkaline solution, the integrated chemistry stages involves circulating the PNF acid, draining and rinsing with pure water. Cycles are automated.